Whenever people come from one place to another place, there are always some surprises. There are still some people who think when they come to Phoenix they'll see lots of dusty trails, tumbling tumbleweeds, cowboys and Indians, sand dunes, and people wearing cowboy boots and cowboy hats. Well, Phoenix some of those things, but that's not really what the metro Phoenix area is all about. Lest you come with the wrong idea, here are 10 things you won't find in Phoenix. The roads are in great condition in the greater Phoenix area. Highways are constantly being built and improved to meet the demands of an ever-growing population. Rubberized asphalt has made travel on many of the highways quieter and even smoother than before. So you won't find that your car needs an alignment every time you go out for a drive. There are two problems, though, with keeping the streets and highways in great condition: (a) there are always road restrictions all over town, and (b) better roads mean that people drive faster and more aggressively. The greater Phoenix area is relatively new. You won't find historic battlegrounds here like you find at Gettysburg, or in the South. You won't find 500-year-old castles here. Some of the homes that are considered historic are only 50 or 60 years old. As a territory, Phoenix didn't become the capital until 1889, and Arizona became a state in 1912. What you will find here is a great deal of history about our native ancestors. Of course there are cab companies in Phoenix, and you can call dispatch to get one. It just isn't like New York or San Francisco here, where you can walk out into the street in the business district and hail a cab. Also, remember that although there is a city center in Phoenix, it is rather small compared to other major U.S. cities, and both our business and leisure activities are spread out around about 9,000 square miles. Rent a car. Cabs get pretty expensive here. Well, yes, of course you can walk downtown, and there are organizations forever working on making downtown Phoenix an attraction. There are definitely downtown destinations including the Herberger Theatre, Symphony Hall, a Phoenix Suns game at the US Airways Center, an Arizona Diamondbacks game at Chase Field, the Arizona Science Center, festivals at Heritage Square, the Arizona Center, and more. CityScape is a new development downtown with shopping, entertainment, and restaurants. But Phoenix just isn't really a walking place. It's more of a go-park-do-leave sort of place. This doesn't only apply to downtown Phoenix, by the way. Except for a couple of art walks and the zoos and gardens, this is just not a walking town. It's too spread out. You will not be impressed by the skyscrapers as you fly in over downtown Phoenix. The tallest building is 40 stories tall. Downtown Phoenix is in the flight path for Sky Harbor International Airport. As a matter of fact, Sky Harbor is only five minutes from downtown Phoenix, which makes it much more convenient than some major cities that have airports an hour or more away. Other cities and towns in the Greater Phoenix area don't allow tall buildings either. High fashion is not as prevalent here as it is in some other major cities in the U.S. As far as higher end clothing is concerned, you're more likely to find places like Sak's, Chico's, or Ann Taylor. Yes, Phoenix is landlocked. No beach here. This is a real issue for those who move here from the East Coast, and for people from California who miss the sea breezes and the sound of the crashing waves. The good news is that it could be worse. Phoenix can get to the ocean by car in less than a day. Head to Rocky Point in Mexico, or over to San Diego. As a matter of fact, so many Arizonans visit San Diego to enjoy the ocean environment that they have a name for them: Zonies. Because the humidity is relatively low in the desert, and Phoenix doesn't salt the roads in the winter, cars and SUVs hold up pretty well. You will rarely see a rusty vehicle. It is common for car collectors to store their vintage and valuable vehicles in the desert's drier climate. Yes, you can actually find all three of these here, but it's not like there are cowboys everywhere, and hitching posts at the local Nordstrom. Some of the restaurants have sawdust on the floor, but this isn't Wyatt Earp's wild west anymore. Citizens don't generally walk around with guns in their holster (even though it is legal to do so). 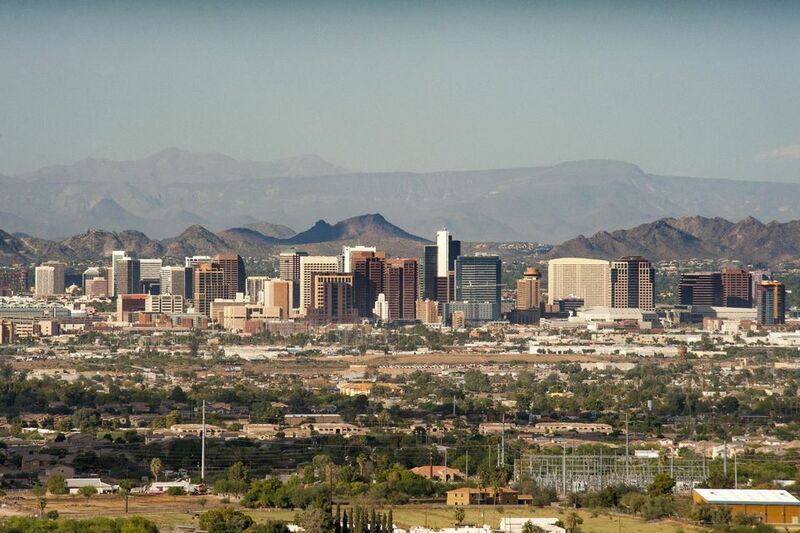 Phoenix is the 6th largest city in the country and it acts like a major metropolitan city. That quaint western town image is long gone. You can still get a little Wild West if you visit Cave Creek (north of Phoenix) or Wickenburg (northwest of Phoenix). There are few bargains in the greater Phoenix area, and high season runs from September/October through April/May. That about covers everything that isn't hot. It isn't unusual to find hotel rooms in the hundreds of dollars per night. Depending on what kind of special events are going on, finding a room in a nice neighborhood for less than $100 per night can be difficult. If you are coming in January or February, let's hope you are traveling on an expense account. Can You Take the Train to Phoenix? Yes! Well, Sort Of. Maybe Not. The Weather and Climate in Arizona: Too Hot to Handle? What's Up With All the Cinder Block Fences in Phoenix? What Time Is It in Phoenix? Jobs in Phoenix, Arizona: What Do They Pay? How Long Does It take to get From Phoenix to ...?